Jogar agora Grand Hold'em online gratuitamente! Casino Holdʼem is a variation of the poker classic Texas Holdʼem that enjoys growing popularity in casinos around the world. The most notable feature is that you don't play against several poker players but the dealer instead. 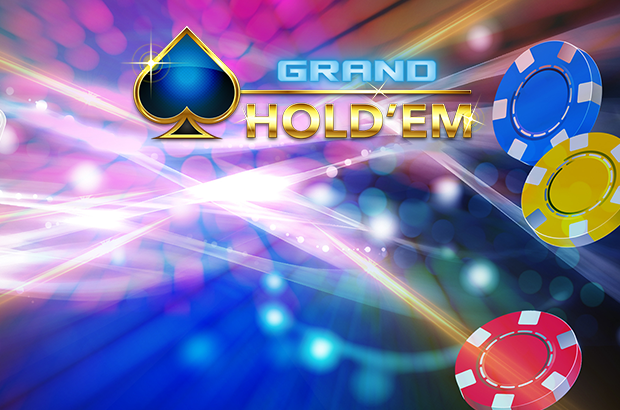 And the online version Grand Holdʼem delivers thrilling poker action with outstanding Novomatic quality! In the poker game Grand Holdʼem you try to create a combination of 2 own cards and 5 community cards that tops the dealer's hand. Each round starts with a basic bet (Ante). You can also opt for an extra bet (Aces or Better: you bet on a Flop, the 2 own cards plus the first 3 community cards). After the first three community cards have been revealed it's decision time: Call or Fold? If you want to keep on playing pick Call. Your Ante bet (starting bet) is then doubled. Afterwards, the remaining 2 cards are revaled and you find out whether you have beaten the dealer with your bet! Please note: the dealer qualifies with a Pair of Fours or better cards. If the minimum value is not reached you receive the winning value of your Ante bet according to the paytable and your Call bet is being refunded (Push). In case of a tie you get all bets back. Play Grand Holdʼem free of charge? Not a problem on GameTwist! If you love poker you can enjoy the buzz of this iconic card game even more with this online version. Because unlike at crowded poker tables a round of this game only takes a few seconds. Moreover, there is only one opponent in this Novomatic game innovation: the dealer! The gaming fun is boosted by the fact that you can risk the odd higher bet provided you have enough Twists in your player account. Grand Holdʼem is an easy to play game and a great opportunity to get a feel for poker as well as practise for larger rounds. A casino that is open 24/7? A website offering games for different applications such as computer, smartphone/mobile and tablet? A place where you can play some of the most popular casino games? GameTwist can do all that and is also THE website for sheer gaming fun! We offer a host of other games besides our thrilling poker games (highly recommendable: Live Poker and American Poker II). How about some iconic table games such as roulette or blackjack? And as if that were not enough, GameTwist offers captivating games of skill and Bingo variants as well as countless slots and slot machines, i.a. from Novoline! Ready to embark on a casino adventure and play outright top games? And who knows: maybe a huge win is only a few clicks away!